Something special is happening at Jesse Dean Designs. The shop is in constant motion like a well-oiled machine. Conversations and the whirring of machines echo through the place. Occasionally, one of the crew cracks a joke and everyone laughs. Nestled at the center of the shop, like the nucleus of an atom, is Jesse Dean. Whether he’s designing custom-engraved pieces, manufacturing turntable parts, or prepping something to be 3D printed, all these roads eventually lead to his end goal of continuing to push the envelope and building the community. One of Dean’s T-shirt slogans is, “Customize Life.” After hanging out there during a typical day, you realize it’s not just a catchy phrase to slap on clothing. It is simply his life. For many people growing up in the Antelope Valley, the stark landscape and lack of activities can lead to making poor decisions. For Dean, it has almost provided his imagination with a blank canvas for his creative vision to flourish. Throughout his youth and into adulthood, his fascination with custom work began with fixing up cars and various creative projects. 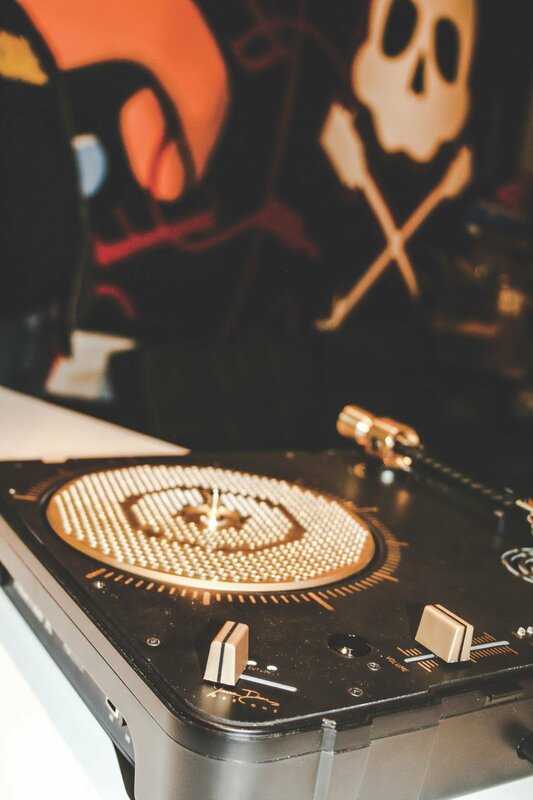 In 2008, Dean customized a set of turntables for fun. Over the next several years, through word of mouth, he became so busy, he decided to go into business for himself. That happened in 2011. He has also built their booth at the NAMM show and built custom turntables for Incubus, Cypress Hill, Slipknot, House of Pain, Limp Bizkit and even a custom LED guitar for AFI’s Eclipse tour. “This is the kind of stuff I would do after work, but now it’s putting food on the table for my family,” Dean said. He is also a key pioneer for the “Portablist” turntable movement. Normally, portable turntables aren’t designed for professionals. After being approached by a prominent DJ company, JDD developed a complete portable system that has grown to a movement. Last year, Dean went on a tour to territories that use his turntables, like the United Kingdom, Japan and across Europe. The best part of this new movement is that all of Dean’s parts are designed and built in the Antelope Valley, using as little outsourced components as possible. His crew consists of Jim Kelso, a graphic artist; Benny Sunderland, a machinist; Drew Gross, an up-and-coming apprentice and Steve Beaver, JDD’s instrument/amp tech and custom worker. As businesses become more multi-national, they usually move production to a cheaper location. Dean’s goals are the exact opposite. It doesn’t matter how far Dean’s work has taken him. His roots are still strongly grounded in the AV. Innovators like Dean and his crew have the potential to represent this Valley in a way not possible before — not just amongst our community, but for artists and creative types across the globe. As I was leaving Jesse’s shop, a friend walked in and began to discuss plans for a set of turntables with a Black Panther type of color scheme. “That would be dope”, Jesse said. On the current path they are going, his friend may just be right.